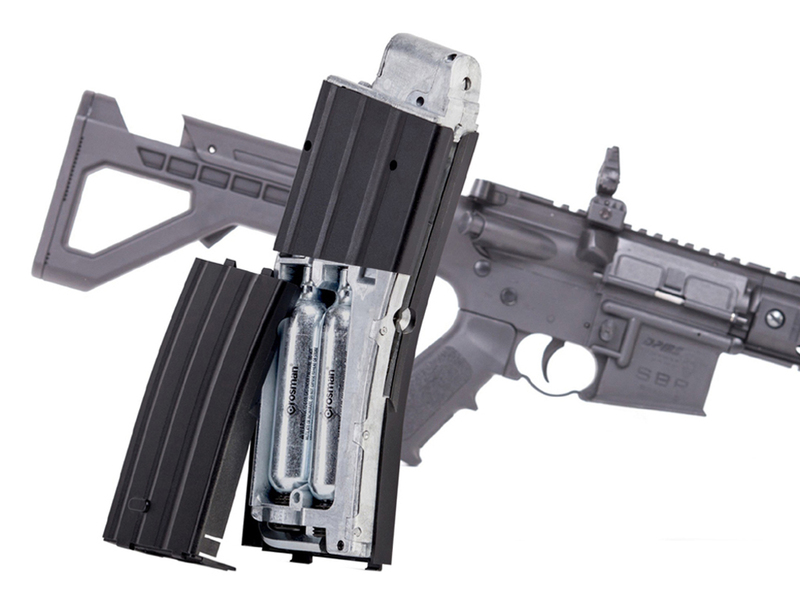 Trigger Pull: The trigger pull on the Crosman DPMS SBR BB Rifle is single action only since the charging handle must be cocked first before you can shoot it. The trigger is short and fairly light but not too light that a misfire can happen easily. 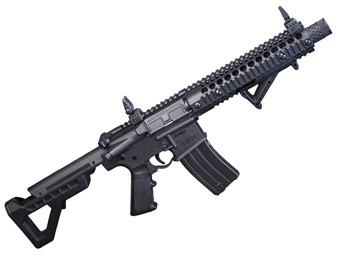 This M4 rifle makes for a great action shooter in semi-auto or full-auto mode! Accuracy: My first volley was with 10 rounds in semi-auto firing mode and resulted in a tight grouping with 8 out of 10 shots landing within ¾-inches. I then adjusted the sector switch to the much more fun full-auto mode for the 15 remaining rounds and let her rip until the bolt locked back. To be honest I was fairly surprised at how tight the group was. It only spread out to about 2 inches with not too much vertical drop, so velocity remained pretty consistent. 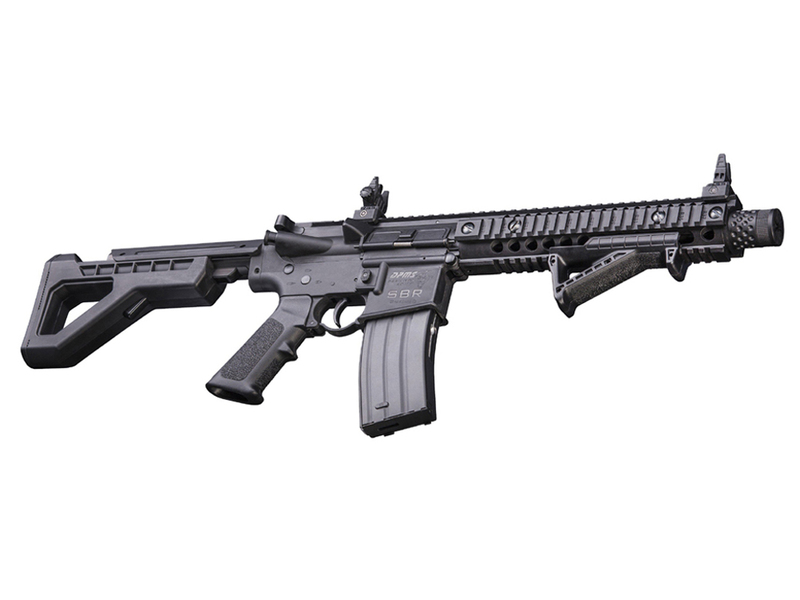 Build Quality: The Crosman DPMS SBR is well made all around. Weighing in at 6.2 pounds, it feels sturdy and solid. There is a lot of metal both inside and out, but keep in mind the top and bottom receiver are polymer. Pretty much all the movie parts are metal, including the magazine, the internals, the buffer tube and the barrel. 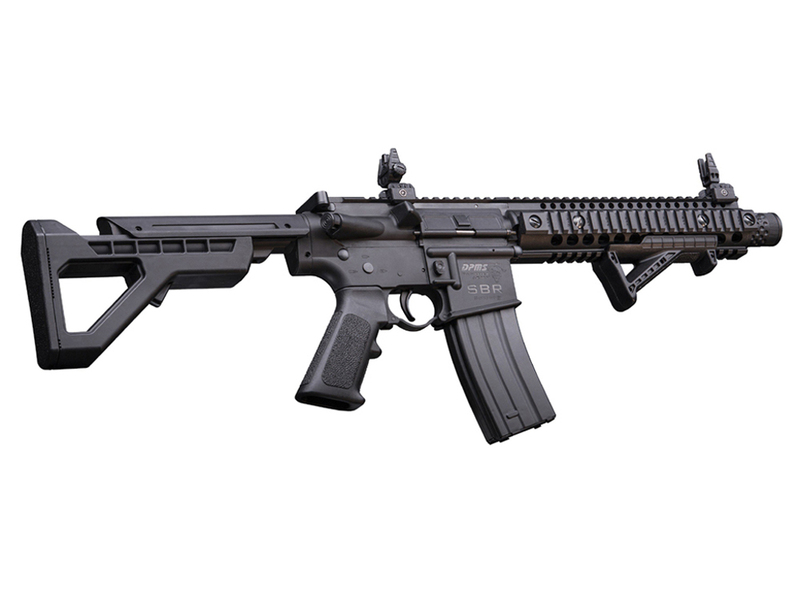 Realism: The Crosman DPMS SBR is about as real as you are going to get in a blowback M4 style airgun. You can even take it apart into the top and bottom receivers like the real steal version. The blowback action gives you some recoil but more importantly offers a true single action trigger and of course the full auto ability we all love. Almost all the moving parts work like they would on a real M4, other than the forward assist which is molded into the receiver. Comments: There's nothing not to love about the Crosman DPMS BB Rifle! 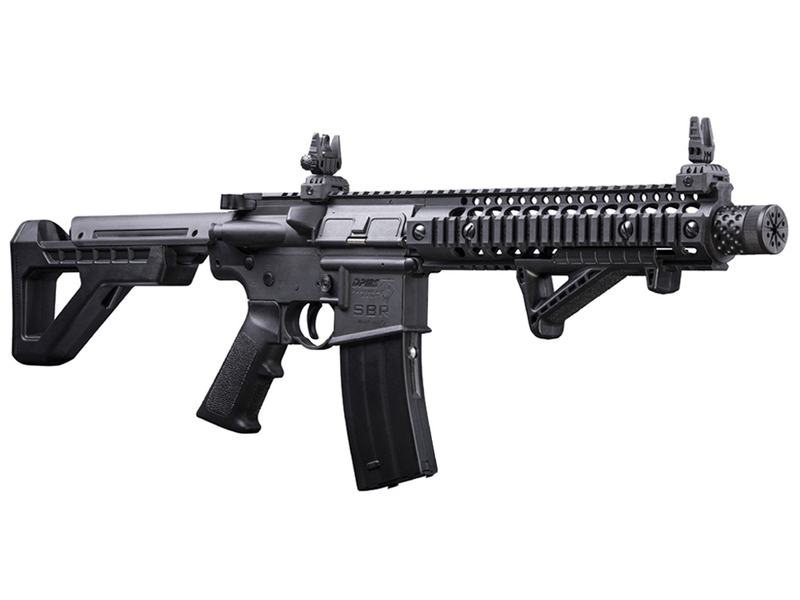 The compact SBR (short barrel rifle) setup is lightweight and agile, perfect for target practice in full-auto mode. It's easy to upgrade with your choice of RIS accessories, and comes with some pre-installed features like flip-up iron sights and an angled forward grip. With an authentic single action trigger, functioning charging handle, and powerful blowback system, this gun provides an ultra-realistic M4 rifle firing experience! This gun ROCKS!!! The blowback action is amazing and it's pretty loud for a BB gun. Spare mags are NOT cheap but I bought a couple anyhow. A fantastic gun for backyard plinking!!! By far this is the best gun in my collection. I absolutely love the blowback action and the way the gun is very close in resemblance to the real steel version. The only reason that I gave the review 4 stars is the speed loader that comes with the gun jams a lot. I actually ended up breaking mine while filling the mag for the second time. But as for the gun itself, I absolutely love it. So getting to the results of the Crosman DPMS SBR CO2 Blowback BB M4 Air Rifle... I was using a somewhat used set of 12 gram CO2 cartages that I had previously shot a couple of magazine through shooting in a bit of semi auto and full auto so I would assume I had at least half of, if not a bit more of my CO2 left in them. The Crosman DPMS SBR CO2 Blowback BB M4 was also fully warmed up and it had been a day since I shot it last which lets the CO2 and the gun warm up and pretty much perform as if it was using new CO2 for the most part. -Most realistic working M4/AR 4.5mm BB Rifle out there right now. -Great weight and feel to it. -Duel CO2 full metal drop out magazine that holds 4.5mm steel BB’s as well. -Lots of rails of mounting additional cool hardware. -Muzzle cap looks cool too! -Receiver is plastic but well made and does not compromise feel or weight since there is lots of metal throughout this gun. -Rear Buttstock is not compatible with the AR platform. 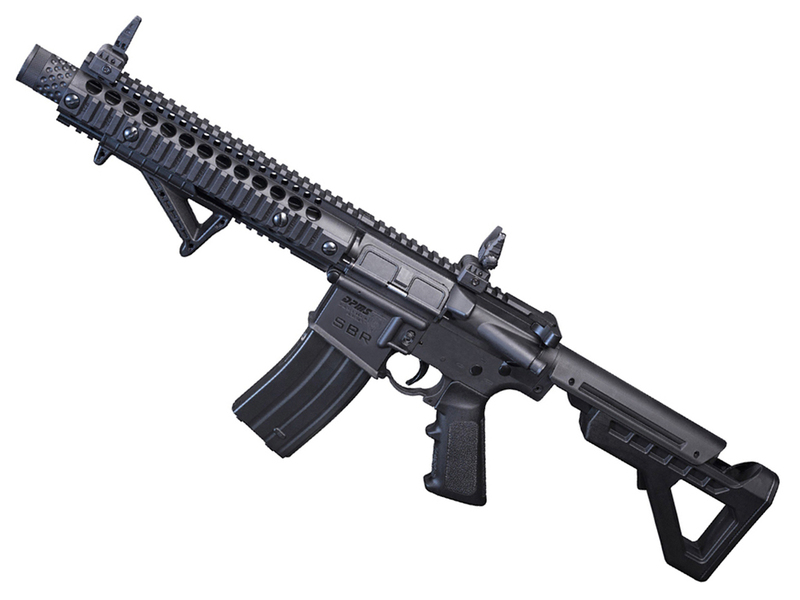 If you haven't figured it out already I love the Crosman DPMS SBR CO2 Blowback BB M4 Rifle and I know anyone that picks one up will love theirs too! I just wish we had them in our Replica Airguns Store but for now we are not Crosman distributers :( We do have some other nice M4/AR styled BB rifles like the HellBoy which I may put head to head against the Crosman DPMS SBR CO2 Blowback BB M4 Rifle at some point even though they are very different in how they operate and their pros and cons.